A shopping mall in Luoyang, central China's Henan Province, has set a new world record by creating a huge 8m high cake. 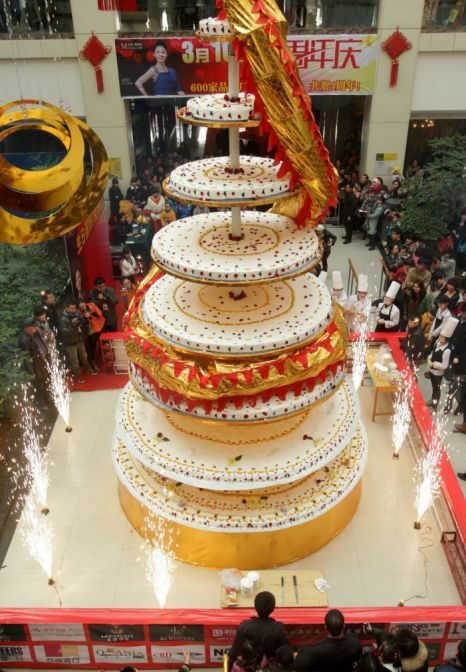 The eight-layer cake used 500kg of eggs, 260kg of flour, 200kg of cream, 100kg of fruit and 80kg of chocolate. The final product weighed nearly 2 tons, with each layer supported by round metal plate. It took 20 chefs 24 hours to make the cake, which broke the previous Guinness World Record of a 7.8m, made in Paris in 2010. 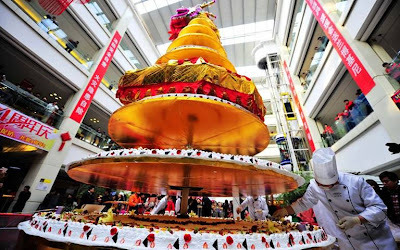 Once the record had been confirmed the cake was shared out among 3,000 people.